But now a team of scientists working at the Southwest Research Institute in the US has captured the world’s first detailed image of thunder, and it looks even more incredible than we ever imagined. 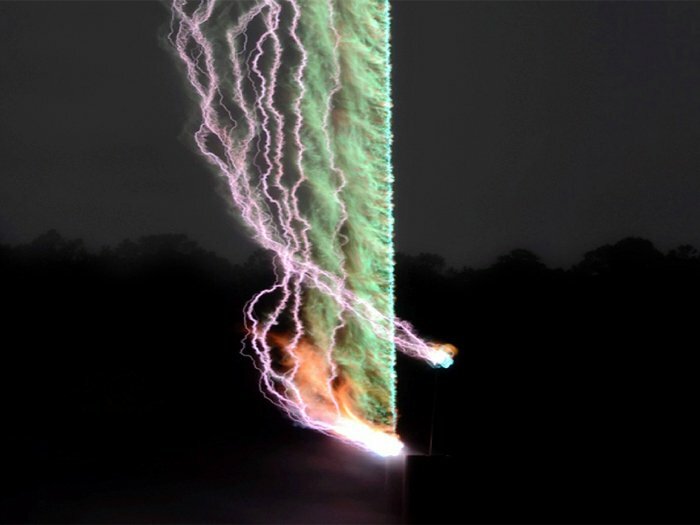 The image was created using acoustic wave maps, which were based on recordings from a range of microphones positioned around an artificially generated lightning strike. Because sound waves from higher elevations take longer to travel to the microphones, these recordings allowed the scientists to visualise how the claps and rumbles emitted during a storm move in space. To understand how thunder works, you first need to understand lightning, which is created by electrical charges moving either within a cloud, or between the cloud and the surface of the Earth. As this charge travels, it heats up the surrounding air, triggering the dramatic release of energy, which causes thunder. To map the process, the researchers shot a long, Kevlar-coated copper wire into an electrically charged cloud, as you can see in the Science News video below Science News Video. The result is an impressive lighting strike and resulting thunder, captured by 15 ultra-sensitive microphones positioned 95 metres from the strike point. The researchers found that the thunder was louder when more current flowed through the lightning, a discovery that could one day help scientists use thunder to work out how much energy is being conducted through lightning. This could potentially be useful if we work out how to harness thee energy from lightning. The results of the research (and this spectacular image) were presented at the meeting of the American Geophysical Union on May 5. Watch your back, lightning, who’s the show pony now?